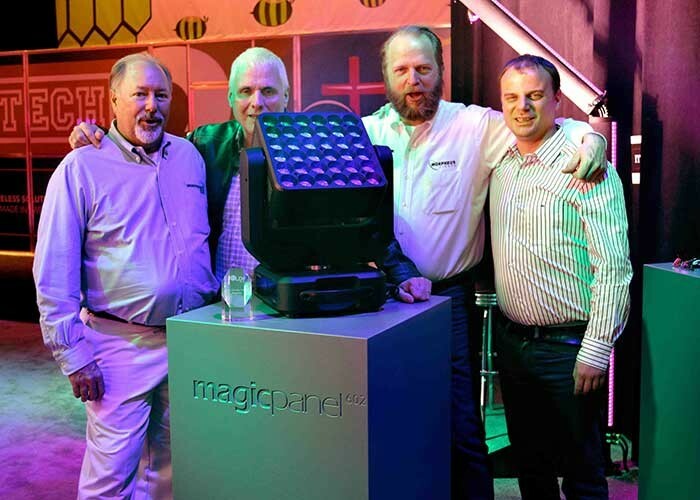 Las Vegas - Released in April this year, the instant success of Ayrton’s MagicPanel602 has been acknowledged at the LDI show in Las Vegas where it received the 2013 LDI Award for Best Debuting Product of the Year in the Projection category. Ayrton MagicPanel602 is a moving head LED beam projector equipped with 36 15W Osram RGBW emitters in a 6 x 6 array. Each emitter projects a tight, powerful 7.5° beam and can be controlled individually or used collectively to produce a coherent 12,000 lumen shaft of light. Under individual control, the emitters can be pixel mapped or driven by video via Art-Net or Kling-Net. To supplement the graphic possibilities this control provides, MagicPanel602 can be continuously rotated on both pan and tilt axes, which adds a dynamic dimensional effect to beams individually projected by mapped emitters. MagicPanel is obviously also controllable via DMX-512 and is RDM compatible. The dynamic LDI Awards ceremony, which took place on the show floor of the Las Vegas Convention Center on the Saturday, always generates a buzz as the industry gathers to see what’s hot in current technology. Accepting the Award were Ayrton’s Valère Huart and Yvan Péard, and Morpheus Lights’ Mark Fetto and Paul Weller. Morpheus Lights is Ayrton’s US distributor. “It is an honour to receive this award that means a lot to us,” says Ayrton’s export manager, Valère Huart. “We have been delighted by how quickly MagicPanel has been adopted by the major lighting designers from the moment it was launched. To receive the acknowledgement of the American market with the award for Best Debuting Product of the Year is extremely exciting. In picture: Mark Fetto, Yvan Péard, Paul Weller and Valère Huart.